There are so many reasons why carrying your baby in a carrier or in arms is beneficial to both parent and baby. Babywearing enhances parent and baby bonding , it’s practical, and it facilitates breastfeeding. It’s good for other caregivers too. Being carried fulfils a baby’s strong need to have a sense of security and attachment. It also means that parents or caregivers can be more speedily able to respond to the baby’s needs. Skin to skin contact helps to regulate heart and respiratory rates. Close contact is also known to enhance growth rates and weight gain. Babies adapt to the environment after birth in different ways. In the last months of mother’s pregnancy they have been held securely in flexible but containing walls. Baby has been in relative darkness and warmth, listening to the regular constant beating of their mother’s heart. They have felt a rhythmic and gentle movement with the quite tones of their mother’s voice. The birthing process is a dramatic and overwhelming experience that results in all that was familiar being replaced by brightness, noise, separation, sudden stillness and rapid movement. 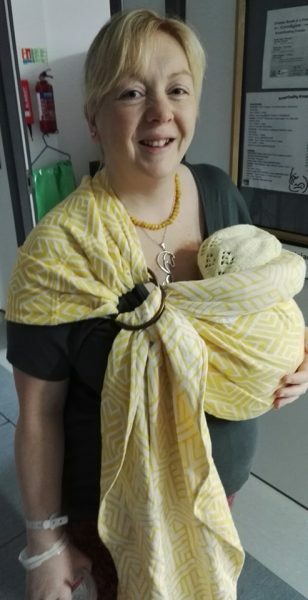 The benefits of carrying your baby are demonstrated by allowing the parent to keep the baby on their chest, contained with soft supportive fabric. Babies calm when placed on mum’s chest, feeling her warmth and the muffled sound of her heartbeat and the rise and fall of her breathing.